Classic Rock is a British magazine dedicated to rock music, published by Future, who are also responsible for its "sister" publications Metal Hammer and Prog magazine. Although firmly focusing on key bands from the 1960s through early 1990s, it also includes articles and reviews of contemporary and upcoming artists it deems worthy of note. Despite starting as an on-off project it became one of the UK's best selling music magazines. In September 2010 it published its 150th issue. Prog is a British magazine dedicated to progressive rock music, published by Future. The magazine, which is edited by Jerry Ewing, was launched in March 2009 as a spin-off from Classic Rock and covers both past and present artists. Other current staff are Hannah May Kilroy, Russell Fairbrother, Natasha Scharf, Jo Kendall and Malcolm Dome. Rimensberger, who started and owned Metalhammer UK Ltd and the registered rights of the name, later sold them to Wigginghaus whilst remaining in the background until the early nineties as an adviser to Wigginghaus. Rimensberger was the promoter of the first Metalhammer Lorelei Festival, with leading metal acts such as Metallica, Motörhead and Venom. It was he who recommended Metallica to Peter Mensch (AC/DC) for management. [ citation needed ] Rimensberger also linked the name Metal Hammer with other successful brands such as the BBC ( Friday Rock Show with Tommy Vance), MTV Metal Show with Bailey Brothers and Castle Donington Monsters of Rock Festival. Harry Doherty, formerly of Melody Maker , became the launch editor of the English-language Metal Hammer, also producing the Metal Hammer TV show on satellite television. He left to found the video magazine Hard'n'Heavy, before being asked back by Wigginghaus to take over all the European issues of Metal Hammer and other associated magazines, such as Rock World. In association with Picture Music International, the video arm of EMI Records, Doherty also launched the Metal Hammer Video Magazine, in direct competition with his earlier creation, Hard'n'Heavy. Doherty left after a management dispute with Wigginghaus. Harry Doherty's original personal assistant Sue Powell went on to manage the London-based offices under Wilfried F. Rimensberger. As of June 2011, Bezer has left Metal Hammer to pursue work elsewhere, and was replaced on the podcast by stand-up comedian Stephen Hill. Gill also left Metal Hammer on 3 February 2012, the date he last featured on the podcast. He was replaced on the Podcast by Metal Hammer Deputy Editor at the time Merlin Alderslade. Malcolm Dome is an English music journalist. He has written about rock and heavy metal since 1979. In addition to writing books, he has been a journalist for Record Mirror, Kerrang!, Metal Hammer and Classic Rock among others. Dome co-founded the UK's first rock radio station, TotalRock, along with Friday Rock Show DJ Tommy Vance and producer Tony Wilson. After 17 years with the station, Dome left in March 2014 to join Team Rock full-time. Phenomena is a rock music concept formed by record producer Tom Galley and his brother, Whitesnake guitarist Mel Galley. During the recording of Phenomena I, they were joined by Metalhammer founder Wilfried Rimensberger. Contributors were leading rock musicians such as Glenn Hughes, Brian May, and John Wetton, amongst others. Raw Magazine was founded in the summer of 1988 by Dante Bonutto, Malcolm Dome, Mark Putterford and Steve McTaggart and photographer Tony Mottram drafted in from Metal Hammer. They had come together on Metal Hammer magazine having split from Kerrang!, where Bonutto had been deputy-editor. The collective feeling there had been that Kerrang! was becoming too narrowly focused on heavy metal and that Metal Hammer would allow them more scope to explore other areas of rock music. This quickly proved not to be the case and the idea for a new magazine was born, a title that would be a true rock magazine, featuring heavy metal acts but not dominated by them. Rich Wilson is a UK-based freelance rock music writer who has written for publications including Classic Rock Magazine, Metal Hammer, Record Collector, Rock Hard, the Virgin Encyclopedia of Popular Music, and Prog magazine. Enochian Theory is a rock/metal/progressive rock band, formed in 2004 in Portsmouth, Hampshire, United Kingdom. The original lineup of the band consisted of drummer Sam Street, bass guitarist Shaun Rayment, guitarist Scott Ware, and singer/guitarist/keyboard player Ben Harris Hayes. Bad Habits is a rock/punk/metal band from London. The line-up has experienced various changes since its original formation in 1984 by former Gypsy Leicester band members who when reformed decided to go in a heavier musical direction from their original formation as Gypsy and therefore used both names interchangeably with the first heavier sounding single for Bad Habits, "Lipstick Queen", released in 1986 on Sniffin’ Rock Magazine and the release of the Gypsy band album Gypsy - Future Teller, containing the album track "Bad Habits", with vocals from John K. on Gypsy - Way Out Of Line, Gypsy - Lost In Berlin and Gypsy - Let Me In. "It Never Ends" is a song by British rock band Bring Me the Horizon. Produced by Fredrik Nordström and Henrick Udd, it was featured on the band's 2010 third studio album There Is a Hell, Believe Me I've Seen It. There Is a Heaven, Let's Keep It a Secret. The song was released as the lead single from the album on 20 August 2010, and was the band's first song to chart when it reached number 103 on the UK Singles Chart, number 3 on the UK Rock & Metal Singles Chart and number 11 on the UK Independent Singles Chart. Purson was a psychedelic rock band from London, England. Founded by Rosalie Cunningham. Purson formed after Cunningham disbanded her previous project Ipso Facto. They are signed with Spinefarm. Rosalie Cunningham describes the sound as "vaudeville carny psych". Bleed from Within are a Scottish heavy metal band from Glasgow. The band formed in 2005 and currently consists of vocalist Scott Kennedy, drummer Ali Richardson, bassist Davie Provan and guitarists Craig Gowans and Steven Jones. The band has released four studio albums; Humanity, Empire, Uprising and Era. We Are Harlot, often shortened to just Harlot, is a hard rock supergroup organized by singer Danny Worsnop, of Asking Alexandria and Jeff George who was formerly Sebastian Bach's guitarist. The lineup also includes bassist Brian Weaver from Silvertide and drummer Bruno Agra formerly of Revolution Renaissance. Formed in 2011, they released their first single titled "Denial" in 2014 and released their debut self-titled album on March 30, 2015 in the US, which debuted in US and UK charts and sold 5,000 copies in the US in its first week. King 810[pronounced King eight one oh] is an American metal band from Flint, Michigan formed in 2007. It currently consists of David Gunn and Eugene Gill. The band's first release was their independent EP titled Midwest Monsters in 2012, which earned them a signing with Roadrunner Records; they released their second EP titled Proem in 2014, and their debut studio album Memoirs of a Murderer that same year. Loathe are an English heavy metal band from Liverpool, England. Formed in 2015, the group consists of lead vocalist Kadeem France, guitarist and second vocalist Erik Bickerstaffe, guitarist Connor Sweeney, drummer Sean Radcliffe and bassist Feisal El-Khazragi. They are signed to SharpTone Records and have released two EP's and one studio album; "Prepare Consume Proceed" in 2015, which was re-issued in 2016 through SharpTone as their first release since the conception of the label, their debut studio album titled "The Cold Sun" in 2017, and most recently the "This Is As One" in 2018, a split EP made with label-mate Holding Absence. The band's works are often categorised within the metalcore genre with experimental elements and have been previously nominated for Heavy Metal Awards best UK breakthrough band and Metal Hammer Golden Gods Awards best new band in 2018. ↑ "2015 Magazine circulation". Press Gazette. ↑ "Jobs lost as rock music media firm Team Rock collapses". BBC Business. Retrieved 19 December 2016. 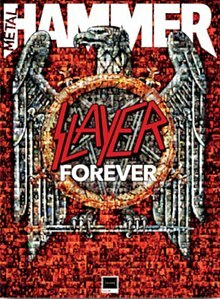 ↑ "No need to fret: Metal Hammer magazine saved from closure" . Retrieved 8 January 2017. ↑ "さまざまな税務業務を行う税の専門家 税理士". Europathewoman.org. Archived from the original on 2015-08-01. Retrieved 2015-08-11. ↑ "Metal Hammer website". Metal Hammer. 19 October 2011. Archived from the original on 21 November 2011. Retrieved 16 November 2011. ↑ "Orange Amplification presents The Metal Hammer Golden Gods 2015 in association with World Of Warships". develop-online. 15 June 2015. Archived from the original on 23 July 2015. Retrieved 22 July 2015. ↑ "The Metal Hammer Podcast is Back". TeamRock. 9 February 2018. ↑ "Metal Hammer Germany". Metal Hammer (in German). Retrieved 2018-12-17.